Q. Where can I find info on company's compensations and benefits? Glassdoor (sample search): A jobs and recruiting site with a large database of salary reports. 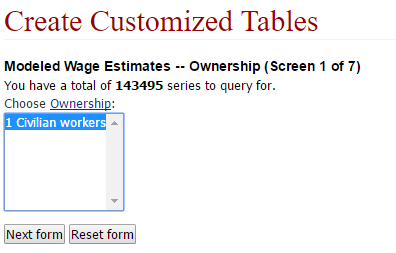 From the Salaries page, search by job title, company, and/or location to see what salaries actual employees have reported. 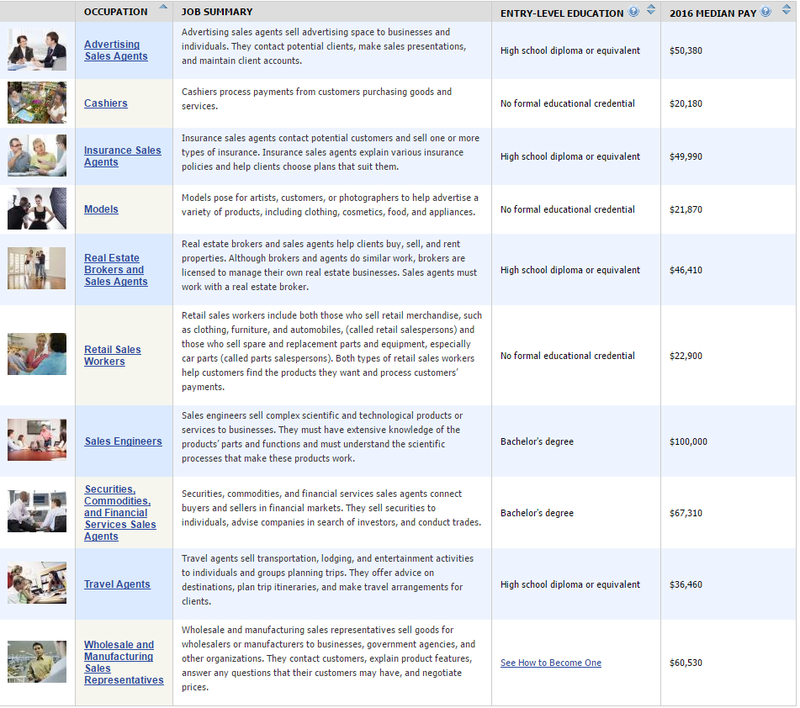 Occupational Outlook Handbook (BLS) (sample search): Search by job category, salary, level of education, and more. This will give you an idea of compensation and benefits for a type of job, but not for a specific company. National Compensation Survey and Employee Benefits Survey (BLS) (sample search): Retrieve wage and benefits data for job category, location, and work level. 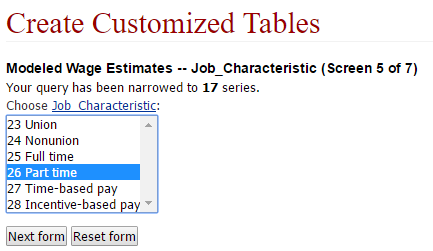 Search the Pay and Benefits databases using the Data Search functions. 1. On the main company page, look for pages labeled Corporate, Employment, and/or Careers. 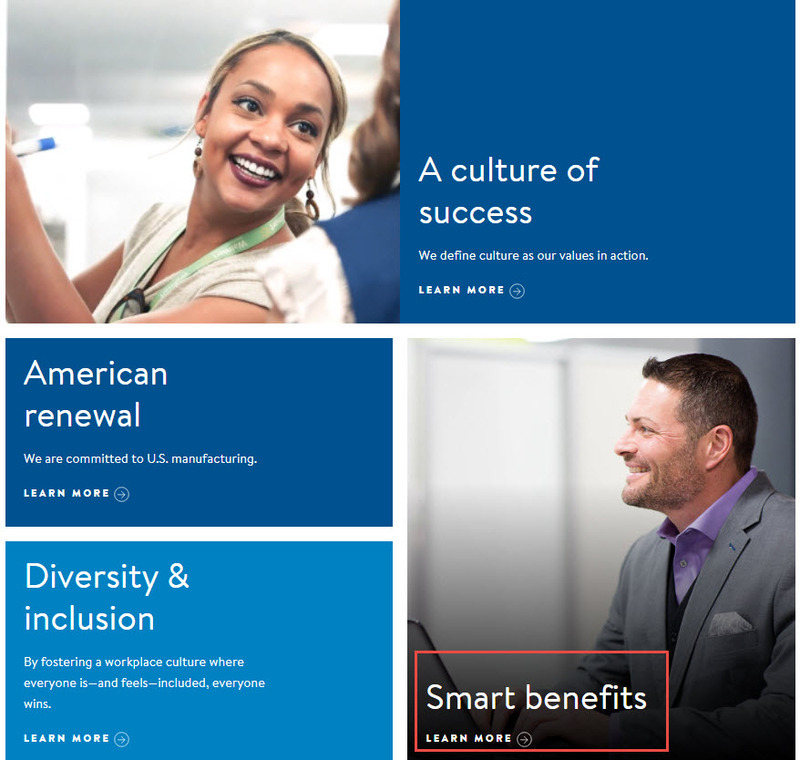 Walmart has pages dedicated to both Corporate and Careers, on the bottom of the homepage. On the Careers page, below the job info there is a section about corporate Culture, Diversity and Benefits. 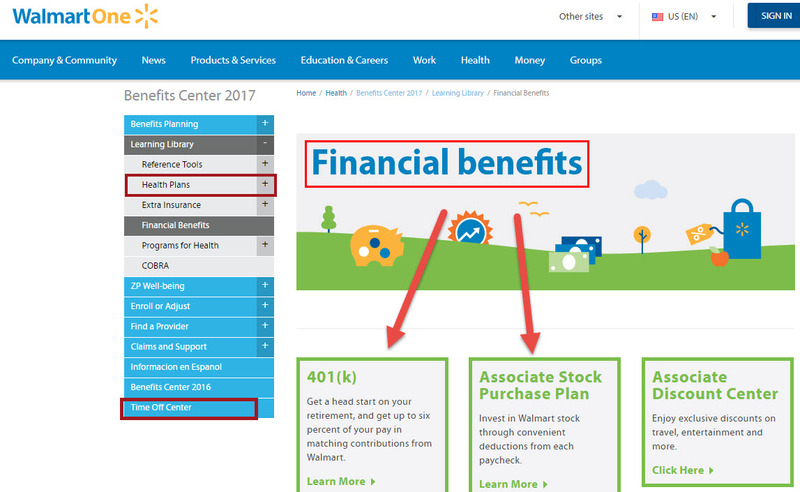 If you click on Smart Benefits, you'll see the Benefits Center page, with links to Financial benefits, including a 401(K) with a company match; to Health benefits, including different insurance plans; and a Time Off Center, about paid time off. Note: Each company site will include different information or use different wording. You'll need to explore a bit to find what information you can. Smaller companies and private or family-owned companies may not include any information on employee salaries and benefits, so consider that if you are allowed to pick your own company to research. Next, use Glassdoor to view employee-submitted salary and benefits information for specific job titles within a company. 1. On Glassdoor's Salaries page, search by name of company or job title. You can search for a specific location, but it is not required. 2. View the company page on Glassdoor to see user-submitted salary and benefits information. Sometimes finding compensation and benefits information about a specific company can be difficult, especially a smaller company. An alternative is to research industries and job categories to find national and regional wage and benefit averages. This information will be more generalized, but you can use it to infer what your specific company might be offering. 1. Start with the Occupational Outlook Handbook, published by the Bureau of Labor Statistics. 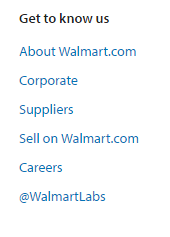 For researching Walmart's retail workers choose Sales in the Occupation Groups menu. 2. From the list of possible occupations within Sales, choose Retail Sales Workers. 3. 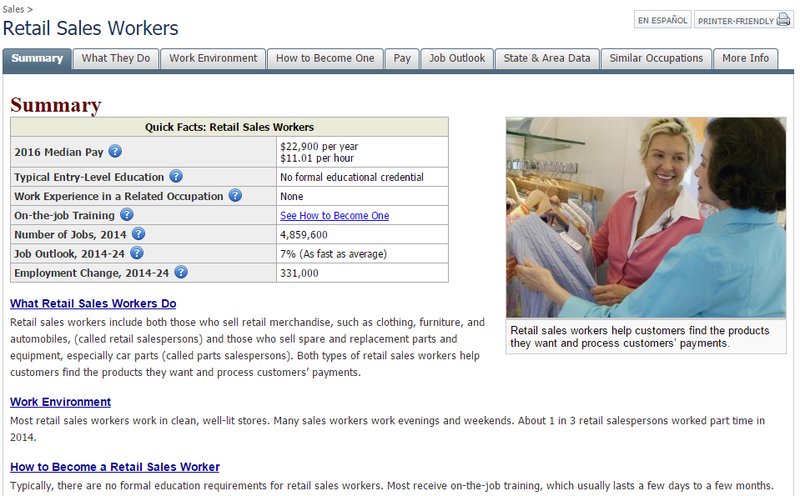 The Retail Sales Workers page will include information on average wages for this job title. You can also retrieve data from the National Compensation Survey and Employee Benefits Survey, both published by the Bureau of Labor Statistics. 1. Choose Multi-Screen Data Search from the NCS Databases page. This tool will require you to choose the type of data you need in a step-by-step format. For an explanation of each step, see the BLS' Help & Tutorials page. 2. The first step to retrieving data is to choose the Ownership. 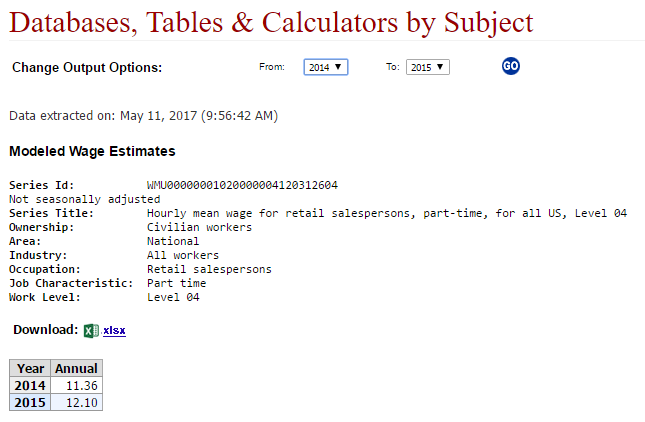 For Modeled Wage Estimates, only data on civilian workers is available. Choose the data you need and click Next form to advance. 3. Choose the area you want to research (national, state, or city). 4. Choose the Industry. 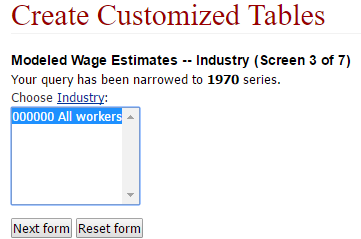 For now, choose All workers to see a categorical breakdown of industry. 5. A long list of Occupations will appear. 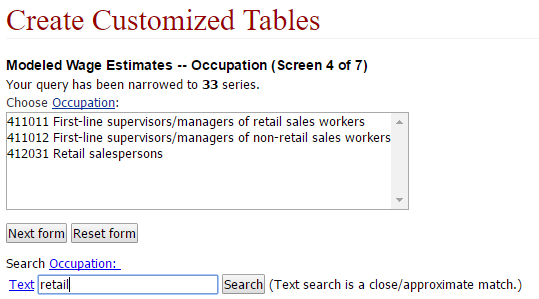 Use the text search box to search by keyword to find the occupation you are researching. In this case, searching "retail" yielded a smaller list from which I can choose "Retail salespersons." 6. Choose Job Characteristics. 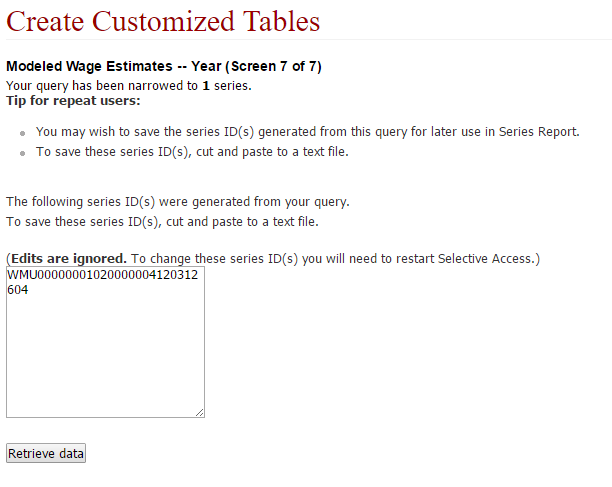 If you are interested in multiple characteristics, you will need to retrieve each data set separately. 7. Choose Work Level. 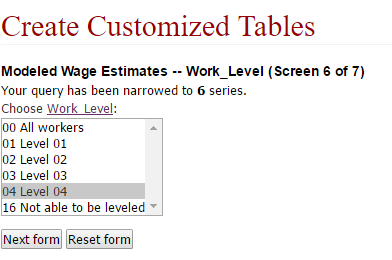 For an explanation of work levels, see the BLS' guide. 9. Your chosen data will appear for the dates available. Data can be downloaded as an Excel file.